Warfleigh neighborhood needs the support of our elected officials to finish the stalled and underfunded North Flood Damage Reduction Project and get us removed from the FEMA 100-year flood plain. By 2018 the 5-year respite from the Homeowner Flood Insurance Affordability Act of 2014 will be over and our neighborhood will FAIL! We supported you in the election, it’s time you support us! ORANGE BEACH, Ala. — The builder of the most luxurious condominiums on this sugar-white sand beach had a problem. One of the twin towers of Turquoise Place was just inside a line on a federal flood map, a small difference that could cost the condo owners more than half a million dollars a year for flood insurance. Three engineers told owner Larry Wireman there was no way the flood map qualified for a change, not on this stretch of the Gulf of Mexico, not in a hurricane-prone community where dozens of buildings were destroyed by the most recent of many storms to blow through the area. “There’s no way in hell that’s going to happen,” one of those engineers, Vince Lucido, said he was told by a firm specializing in coastal engineering. But a fourth company saw it differently, persuading the Federal Emergency Management Agency to move the line on its flood maps. Turquoise Place Tower I, which had been in the highest-risk flood zone, was now in a low-risk zone, where flood insurance was optional. The Turquoise Place condominium buildings rise above Orange Beach, Ala. One was moved out of the highest-risk flood zone, and then the other was being moved back in. The condo owners still have insurance through the national flood program, because they buy it voluntarily. But now they pay a much lower annual premium. The building has all the finest amenities, with hot tubs on the 400 balconies that ring the curved towers like striations on a conch shell. The owners have saved more than 90 percent on the premiums they pay into the National Flood Insurance Program, meaning less money to cover losses nationwide. This map change was engineered by a South Florida company called Flood Zone Correction, Inc. 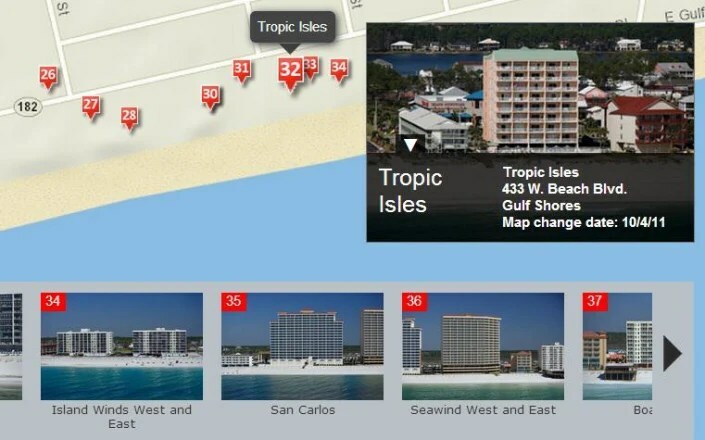 It engineered the map change for Turquoise Palace in 2011, and changes for more than 60 other buildings just in two towns on the Gulf of Mexico. Its founder and president, Dan Freudenthal, says the firm is able to get buildings remapped from the highest-risk flood zones by using newer surveys to counter errors on FEMA’s flood maps. Dan Freudenthal, right, is president of Flood Zone Correction, which has successfully applied to the Federal Emergency Management Agency to rezone about 100 coastal commercial developments out of the highest-risk flood zones. 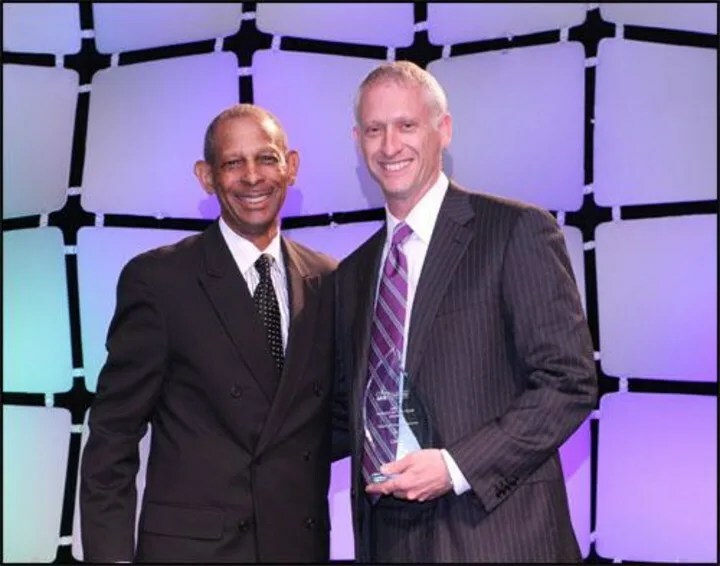 Freudenthal’s insurance agency, CRIO Inc., received the 2010 Agency of the Year Award from FEMA. Freudenthal is pictured in 2011 with Edward L. Connor, FEMA’s deputy associate administrator, who oversees FEMA’s National Flood Insurance Program. FEMA says it doesn’t take into account claims paid out on property by the insurance side of the National Flood Insurance Program, when the mapping side of FEMA considers an application to remove a property from the highest-risk flood zone. Freudenthal (pronounced FROOD-en-thal) told NBC News that he has filed successful applications for flood map changes for about 100 coastal condo projects in Florida, Alabama, Texas, South Carolina and Georgia, in addition to hundreds of inland properties. 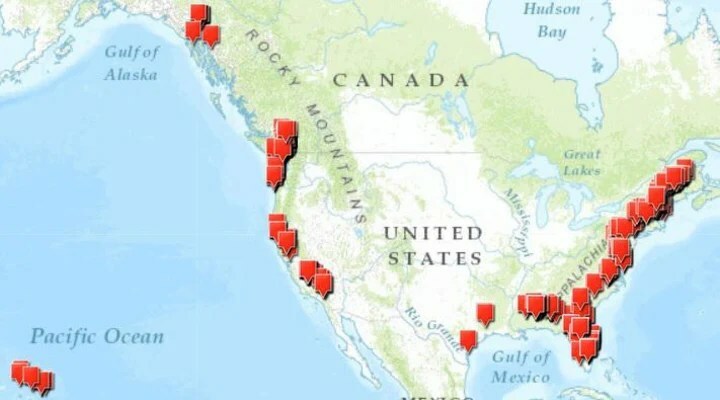 The condo projects are among more than 500 coastal properties (see the map) identified by NBC in FEMA records as having been remapped out of the highest-risk flood zones. Freudenthal’s West Palm Beach company, which also does business as Flood Risk Solutions, LLC, does not work for owners of single-family homes, only for commercial real estate companies. In some cases, Flood Zone Correction has been able to win appeals despite the objections of local officials in charge of reducing flood damage. In Orange Beach and its neighbor Gulf Shores, for example, FEMA asked city flood officials for their support of the map changes, then approved the changes without it. The condo owners save up to 97 percent on their annual insurance premiums, according to the company’s website. Depending on its size, a single building could cut as much as $500,000 a year off its payments into the National Flood Insurance Program. The flood program is running a deficit of $24 billion, a rising tide of red ink that prompted Congress to pass a law called the Biggert-Waters Flood Insurance Reform Act of 2012. The law, which is currently being phased in, requires owners of properties in flood zones to pay their “fair share” according to their risk of flooding, resulting in sharply higher premiums for many property owners. Congress is considering whether or not to yield to the pleas of property owners by forestalling the Biggert-Waters changes. At the same time, new flood maps in many states have raised the estimation of flood risks along rivers, streams and oceans, adding many properties to flood zones for the first time. Yet in the more than 500 instances documented by NBC News, FEMA has quietly moved the map lines to benefit properties that were once considered at highest risk of flooding. There’s no dispute that Orange Beach and Gulf Shores are prone to high-velocity waves. The last big storm to make a direct hit, Hurricane Ivan in 2004, unleashed a 14-foot wall of water that destroyed dozens of buildings. The gulf highway was torn up, and floodwaters surged a mile inland. This resort area rebuilt, bigger and better. When the first Turquoise Place tower opened in 2008, the price of a condo — with a 10-foot floor-to-ceiling view — started at $1.3 million. The 400 units in two towers sit right in the middle of a beach where Ivan caused the destruction or condemnation of The View, Sapphire Beach, Crown Princess and Crown Pointe – four of 16 condo towers in Orange Beach devastated by the hurricane. 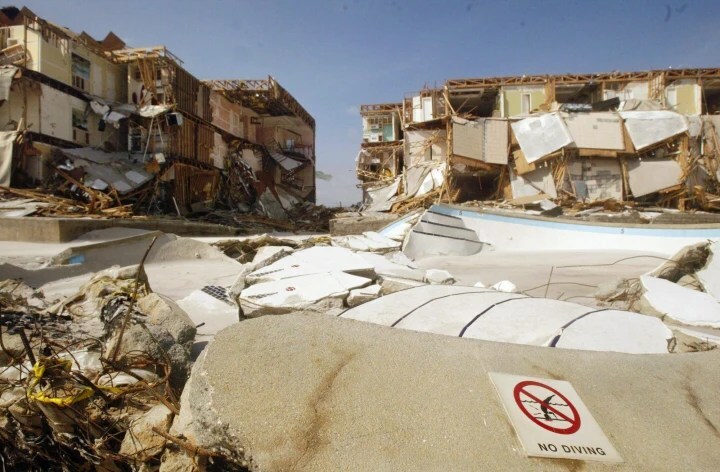 The remains of a swimming pool located between the Crown Point and Crown Princess condominiums destroyed by Hurricane Ivan in Orange Beach, Ala., in September 2004. 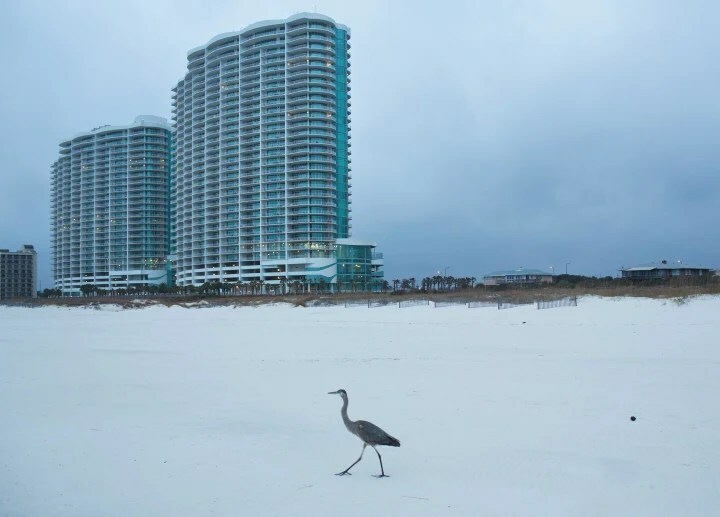 More than 60 condo buildings along this beach in Orange Beach and Gulf Shores have been rezoned out of the highest-risk flood zones by the Federal Emergency Management Agency. Flood Zone Correction arrived in 2010, signing up gulf front condo associations to apply to FEMA for change to the flood maps. The condos pay nothing up front for the service. Freudenthal says his company is paid on commission, receiving half of the amount that it saves the property owner in the first year. FEMA allows owners to receive a refund of premiums for not only the current year but also the previous year. Insurance agents said a single building in a high-risk zone can pay $4 million a year, depending on elevation and design. Freudenthal, who has a venture capital background but now is a licensed insurance agent and insurance company owner, said he got into the flood business in 2001 in South Florida, after he and a friend with family real estate investments discovered that FEMA’s maps for his properties were wrong. They saved so much money that they saw a business opportunity. He’s not the only one in this business — FEMA has a list of companies. In about half of the 100 map changes he’s gotten approved, Freudenthal told NBC News, the floodplain administrator for the city or town refused to sign FEMA’s concurrence form. Sometimes, he said, he has to “go over his head to the mayor” to get local approval. Many floodplain administrators in city halls around the U.S., when interviewed by NBC News, said they didn’t believe that FEMA would approve a map change without their OK. But FEMA confirmed that it has done so. While it asks the community’s administrator to sign a concurrence form, a FEMA spokesman said it considers the application just the same with or without that sign-off. In emails to clients and city officials, Freudenthal has touted his company’s connections to FEMA. In 2011, Freudenthal’s flood insurance company, CRIO, was chosen by FEMA as the national insurance agency of the year. When he encounters resistance from a local official, Freudenthal calls Washington. “I just got off the phone with the head of the insurance side of NFIP and one of the head mapping people at FEMA,” he said in one email to a town official. Freudenthal has also touted the connections of the man who worked for him as the engineer on the Gulf Coast map changes. That engineer, Nader Mahmoudpour, told NBC News that “Mr. Freudenthal was exaggerating a bit.” He did work for a contractor, Dewberry, that makes FEMA flood maps, but only as a group leader, not the head of all coastal mapping. Still, there are a small number of coastal engineering experts, Mahmoudpour said, so connections do matter, at least to help with getting answers when a request is stalled. After he worked making FEMA flood maps, Mahmoudpour went to work as consultant for Flood Zone Correction in 2011, petitioning to change flood maps. Until he left in 2013, his applications were evaluated by another FEMA contractor, Michael Baker Corp., which handles the Southeast region. Will fresh sand protect the buildings? In Ocean Beach and Gulf Shores, Flood Zone Correction staked its engineering claims partly on protection by dunes. After Hurricane Ivan was finished, there were no dunes left on the beach. The cities spent money on a “beach nourishment” program, putting sand back on the beach and forming a thin barrier between the beach and the condos, standing about 6 feet to 12 feet above sea level. But Smith, the Orange Beach floodplain administrator, said the sandy berm would provide scant protection during a big storm. For many years, FEMA’s rules said that beach nourishment couldn’t be counted as a protective dune unless it had well-established vegetation to hold it in place. The sand on the Orange Beach and Gulf Shores beaches has only a sparse sprinkling of sea oats. In 2013, after it approved the changes for these beachfront condos, FEMA issued new guidance, saying that from now on it can consider beach nourishment as protection in some cases. See a map from NBC News with details of the condominium projects in Gulf Shores and Ocean Beach. Some of the condo projects have multiple buildings, making more than 60 buildings in all. One big question in regard to the map changes is this: Will FEMA, when it issues new flood maps in the future, override these one-at-a-time map changes — perhaps creating new work for companies like Flood Zone Correction — or will the map changes be “grandfathered in”? The FEMA spokesman said these will be decided one case at a time. 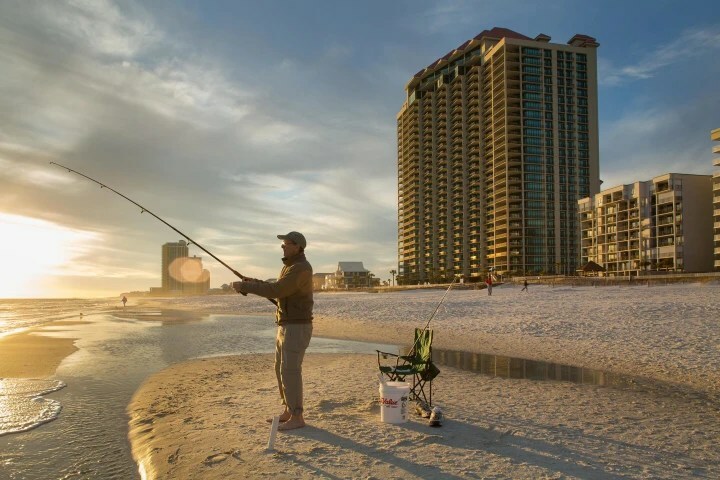 Steve McNew from Fort Wayne, Ind., reels in his bait at the end of a day’s fishing on the beach in front of the Phoenix West II condominium in Orange Beach, one of dozens remapped so condo owners pay less into the National Flood Insurance Program. Freudenthal, the president of Flood Zone Correction, said FEMA sometimes gives the company more than it asked for. For instance, Freudenthal said he filed an appeal on behalf of certain condo buildings in Gulf Shores, with vacant spots in between, but FEMA responded by remapping an entire mile of the oceanfront in March 2013. Now, he said, any future development of those properties can be done without meeting the stricter building rules of a high-velocity wave zone, such as breakaway walls on the ground floor and pilings sunk deep to anchor a foundation. The owner of Turquoise Place, Wireman, said he was pleasantly surprised when FEMA removed his tower one from the high-risk flood zone. “If FEMA is going to approve it, then it must be within FEMA’s rules,” he said. Wireman said it reminded him of a classic Abbott and Costello vaudeville skit about miscommunication. “Who’s on first?” Wireman asked. “If they’re moving one building out of the zone, why would that cause them to put the other building in the zone? ← Block Captain Volunteers Needed!